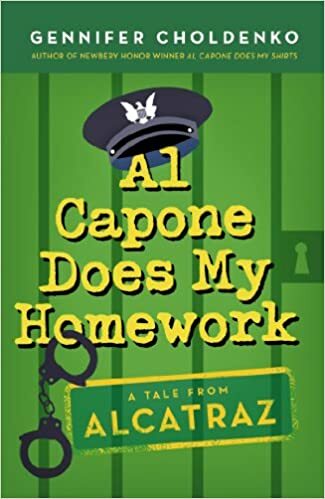 We were about five chapters into the third “A Tale from Alcatraz” book by author Gennifer Choldenko when my son announced that “this might be one of those books I want to read myself.” In other words, our read-aloud pace for Al Capone Does My Homework was not keeping up with his interest, and he wanted to know what happened with Moose Flanagan and his family and friends on the prison island of Alcatraz. One one hand, I am always happy to put another book into his hands. At 12 years old, he is still an avid reader and I want to keep it that way. On the other hand, I too was deep into the story and knew I would miss the read-aloud experience (not to worry, we have a stack of read-alouds ready to go). He took it, read it in a night, and gave it to me, and then I read it over the course of two or three weeks (in-between some other books). Once again, Choldenko does a marvelous job of creating a story that goes deeper than you first expect, as the story revolves around arson, youth pressure, family (including his older sister, Natalie, whose autism is treated with honesty and compassion by the writer), and the strangeness of living on an island full of the most notorious prisoners in the US system at the time of the setting. (Moose’s father is a warden for the Alcatraz prison). Capone is mostly in the background here, but his presence is felt, rumbling at the edges of the story. Moose and Natalie and his friends are skillfully constructed by Choldenko, and my son and I will keep our eyes out for a fourth book, if it ever comes.